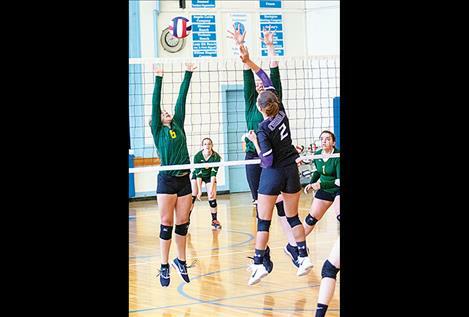 Lady Bulldog Addison Arlint taps the ball over the net. 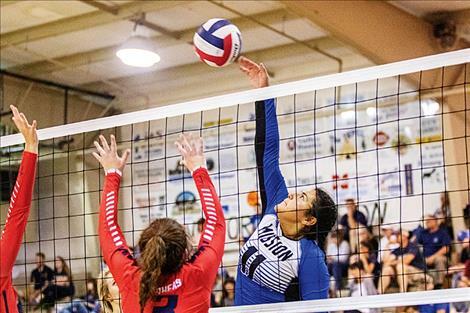 Lady Bulldog River Gonzalez bumps the ball. 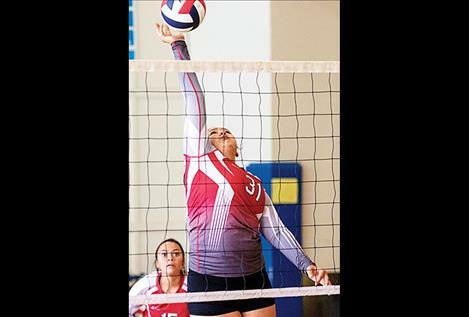 Lady Viking Destiny Manuel battles at the net. The Arlee Scarlets celebrate a point scored. The Arlee Warriors built a 54-6 lead by halftime in dispatching of the visiting Troy Trojans 60-19 on Friday evening. Arlee’s first points of the season came on a 15-yard touchdown run by Darshan Bolen. Bolen ended the evening with three rushing touchdowns and a third quarter 70-yard kick-off return. Warrior Chase Gardner also had a 70-yard kick-off return along with a 22-yard touchdown reception from quarterback Lane Schall. Gardner also scored a defensive touchdown on a 38-yard pass interception. Schall threw two touchdown passes one to Gardner and the other a seven-yard toss to Lane Johnson. The Polson Pirates couldn’t overcome an early 20-0 deficit and dropped their season opener 28-18 on their home field last Friday night. Pirate quarterback Boston Goode threw two touchdown passes for Polson’s only scores of the game. Goode tossed a seven-yard pass to Parker Toth in the third-quarter and hit Ryker Wenderoth on a deep 80-yard strike in the fourth quarter. Landers Smith began his senior season in a big way Saturday night, rolling up 141 yards rushing and scored three rushing touchdowns as the Charlo Vikings cruised to a 42-6 opening-season conference victory over hosting Plains Horsemen. Smith completed six of nine passes for 74 yards and two passing touchdowns. Viking Bridger Foust scored on defense after intercepting a Horsemen pass and returned it 23-yards for a touchdown. Polson Pirate Matt Hobbs shot a 72 on Aug. 20 at the Missoula Country Club and carded a 75 at the Canyon River Golf Club on Aug. 21 to finish first both days and nabbing top honors at the Missoula Invitational. Teammate Trey Kelley shot a 76 and an 84 tying for seventh with two other golfers. In the team standings, the Polson boys placed sixth, while the Polson girls finished seventh. For the Lady Pirates, Cali Cannon finished fifth with a two-day score of 84 and 93. On Wednesday, at the Whitefish Invitational, Kelley shot a 76 for fourth place and Hobbs scored a 77 placing seventh. Cannon was the top Lady Pirate finisher at sixth place with a score of 98. Both Polson boys and girls finished second in the team standings. For the Ronan Chiefs, Conner Cornwell was the top finisher with a score of 94 and Madyson Running Crane scored a 109 as the top Maiden finisher. On Saturday, the Mission Lady Bulldogs hosted the Mission Tip Off Tournament. After emerging from pool play as the fourth seed, the Lady Bulldogs defeated Loyola 21-13, 21-19 to claim third place. The Charlo Lady Vikings garnered second place during Saturday’s Drummond Invitational after falling 15-12, 12-15, 15-9 to Gardiner in the championship match. Charlo reached the finals by coming out of pool play as the top seed, defeating Hot Springs and Arlee in bracket action. 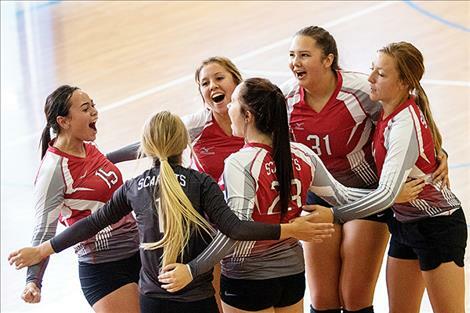 The Arlee Scarlets were the fifth seed coming out of pool play and defeated Seeley Swan to set up the semifinals match with Charlo. 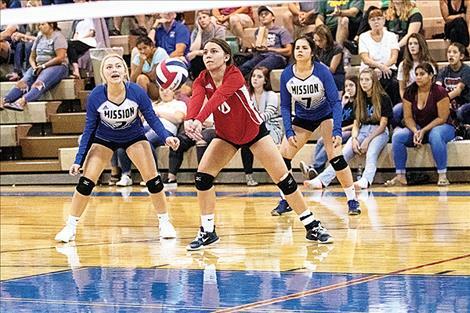 Both the Ronan Maidens and the Polson Lady Pirates struggled in pool play finishing 3-5 at the Western A Volleyball Tip Off Tournament on Friday in Browning.